In the 1960s, reconstructive surgeon Dr Maxwell Maltz observed that by having a facial feature enhanced, a patient not only improved their physical appearance, but experienced a notable psychological improvement, too. Maltz also noticed that with some patients there was no psychological improvement, even though the surgery was successful. This led to the discovery that we have two images of ourselves: one that is reflected from the mirror, and one that we hold in our mind. The one in our mind is our opinion of our self, or self-esteem, and by changing this we can change our world. We are all programmed with a deep-rooted perception of what we are, who we are and what we are worth. Improving self-respect can help us change career, climb the success ladder, increase income, attract love or create a permanent shift in health and fitness. Self-esteem and appreciation are vital foundations for creating permanent happiness and fulfilment in life. Self-esteem and confidence come from our childhood. If we grew up being praised, we tend to believe in our value and power as we go through life. If we experienced criticism or high demands, we will have negative opinions about ourselves, which hold us back in life. For instance, a child that is nurtured and encouraged is going to grow into a confident adult with high self-esteem. Born without limbs, disability rights activist Joanna O’Riordan from Cork is living proof of the impact nurture has on a child – as she unfolds into a radiant, ambitious, confident adult. Her loving parents encouraged her from the day she was born. While we can’t change our childhood, we can acknowledge the root of our self-esteem and be gentle with ourselves as we set out to make improvements. It’s time to sit down and have a chat with yourself and write out what you think about yourself. How do you value yourself? Identify what you like and what you don’t like. Be completely honest and address physical attributes like body shape, face and hair as well as your professional qualifications and abilities. Am I good enough for my job? Do I like my body shape? Write out every detail that comes to mind. How would you like to see yourself? After you have written how you see yourself, take another sheet of paper and, addressing all your limiting beliefs, write how you wish to see yourself. Go with your inner feelings and write, in the present tense, the direct opposite to what you are currently experiencing. “I am shy and uncomfortable speaking in front of people”, could replace: “I am confident and at ease giving presentations”. It may feel far-fetched initially, but this is the starting point to change. Write out your new self-image. Now that you have acknowledged and identified your ideal self-image, it is time to eradicate the false negative opinions that have been holding you back. Repetition is a very effective way of replacing your self-image, and this is done using daily exercises. Set aside five minutes and standing in front of a mirror, read your new self-image, line after line, slowly and feel yourself already in possession of whatever you are changing. For example, saying “I have a great singing voice and enjoy performing” is a good line if you are suppressing musical talents. Your mind will eventually accept and adapt, and you will feel different inside. Taking actions that help you to overcome the limiting image, like performing for friends and family, perhaps is a good way to start. Believing in yourself is the first and most important step in boosting self-esteem. It may seem odd at first, but giving yourself daily compliments will change your attitude towards yourself. Author and self-help expert Louise Hay devised a simple affirmation to speak in the mirror daily: ‘I love you and accept you the way you are’. Repeating this daily will help your mind adapt to seeing you differently, in a more positive light. Another self-esteem exercise is to give yourself 10 compliments daily and speak them, meaning every word. 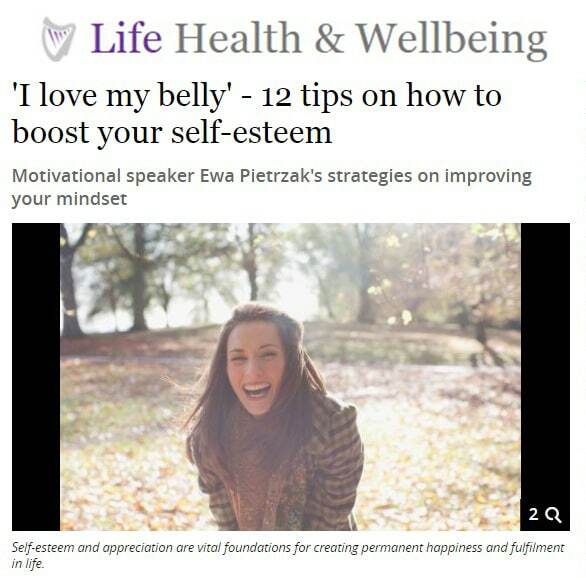 Start by complimenting your body parts, even if you don’t like the way they look: ‘I love my belly, even though it’s a bit big. I love it for digesting all the food I eat’. Progress to compliments about your big and small successes and other things you like about yourself. If you are finding it difficult to come up with 10 compliments, you can get help from friends and family. Ask five people that you respect, and who respect you, to list five things that they value in you. Write all of these down and treasure them and believe them. You will be surprised at how amazing and appreciated you are. Having a positive body image is a sure way to boost self-esteem. Love and accept your height, weight and body shape. If, for example, you are carrying excess weight, it’s a good idea to learn how to shed weight permanently. Weight is determined by 80pc by what we eat – so learn to enjoy food that gives you the body you desire. Slimming World or Weight Watchers can help with weight management. Physical exercise is also a great way of improving body shape and boosting self-esteem, while a nutritionist can help with a diet that is tailor-made for your body. How you feel in your own skin has a huge impact on all aspects of life including earnings, love life and everything else. Wearing clothes that suit your body shape and skin colouring can greatly enhance how you feel about yourself. Liking what you see in the mirror is always a good start to a day – and when you look good, you feel good. If you’re like me and don’t like spending endless hours in shops looking for clothing, it can be a good idea to hire a stylist or get a fashion-loving friend to take you shopping. They can save you time, stress and money by advising you what to mix and match and help refurbish your wardrobe. Even if you do enjoy shopping, a stylist can put a new twist on your wardrobe, making it fresh and exciting. Your hair is your crowning glory and sometimes even a wash and blow dry can make a person feel a whole lot better. Changing hairstyle and getting a new cut can be a great self-esteem booster. If you are in the mood for an extreme makeover, there are numerous hairstyle and makeover apps, which can be great fun if you wish to explore what you will look like with an Audrey Hepburn or Elvis. If you find your hair is thinning, fine or problematic, you could opt for a transplant or hairpiece, which can be very transformational, as a friend of mine undergoing chemotherapy recently discovered. Make sure to surround yourself with people who love and appreciate you. The exercises in the first few points will actually make it unbearable after a while to be with people who criticise you or don’t believe in you, so you’ll be moving away naturally. If you want to find more inspiring and upbeat company, sign up to meetup.com or other communities where you can meet new people and nourish your new confidence. Be selective when it comes to the media you are consuming. Perhaps you fill your spare time watching crime on TV and absorbing bad news. Is this serving you well? Try watching inspiring and educational programmes that make you feel happy instead of bringing you down. If you are spending time on social media, you may find yourself comparing yourself with other people. This is futile and I suggest replacing it with positive material that empowers you. Study YOU. We spend so many years at school and yet learn very little about who we are and what we are capable of. Personal development teaches us what our assets and powers are and how to utilise them to create the results we desire. Numerous books can be found on every self-help bookshelf and these make for relevant reading at a time when you are changing and improving.